We’ll pause for a moment from the mysteries of Egypt to mention another mystery. 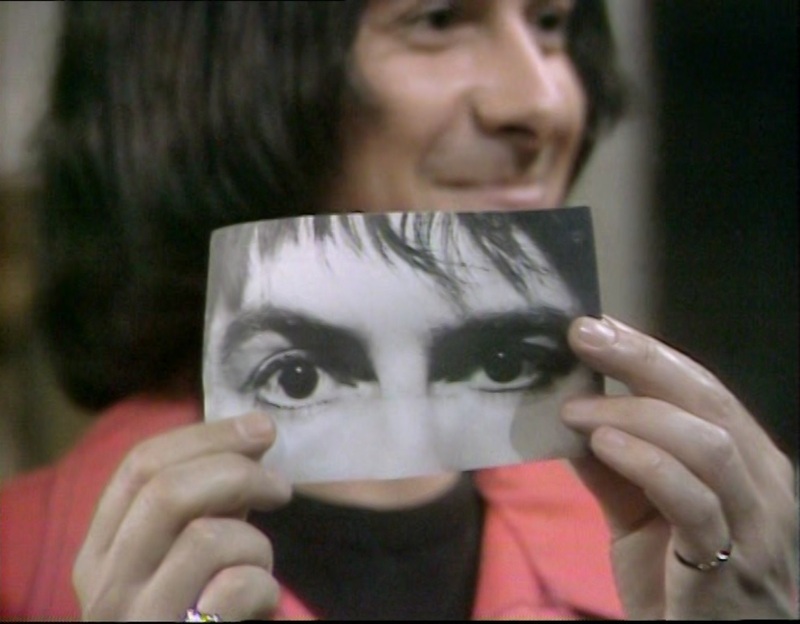 Was Ace of Wands ever shown in America, and, if so, which episodes? This is going to read a bit like “A guy I met swears somebody claimed to have a missing Doctor Who episode,” or “Don’t I recall a bit in the Book of Ezekiel where the wheel landed on a primitive Nazca line,” because I can’t quite prove this, but here goes. TV stations used to get an annual copy of this book, and I can’t even tell you the proper name of it. I always called it “The Syndie Bible,” a big catalog of series, serials, and movies that stations could purchase, and who to contact. I found a few of these in the UGA Library in the early nineties when I was researching a proposed book I was co-writing, an encyclopedia of American TV sci-fi and fantasy. Then the internet happened and the book became surplus to requirements, as you might say. In the book, I found a listing for a package of Ace of Wands being offered to American stations in the 1970s and 1980s by a company called D.L. Taffner. I did a little rudimentary hunting and that seems to make sense. Taffner, an American producer, did a lot of work with packaging Thames TV series for the US. 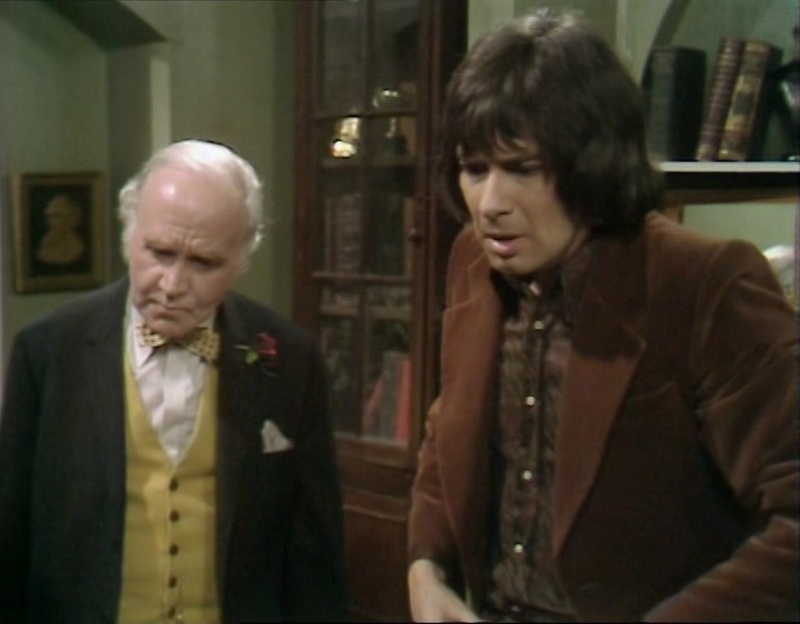 His biggest success was with the various Benny Hill shows and specials, but Taffner later started following in Norman Lear’s footsteps and remaking Thames sitcoms into popular American shows: A Man About the House / George and Mildred into Three’s Company / The Ropers, and Keep it in the Family into Too Close For Comfort. In 1987, Taffner financed a pilot for a revival of The Saint that CBS didn’t pick up. But if any public broadcasting stations – for it was most likely PBS – did show any Ace of Wands in America, which episodes did they show? 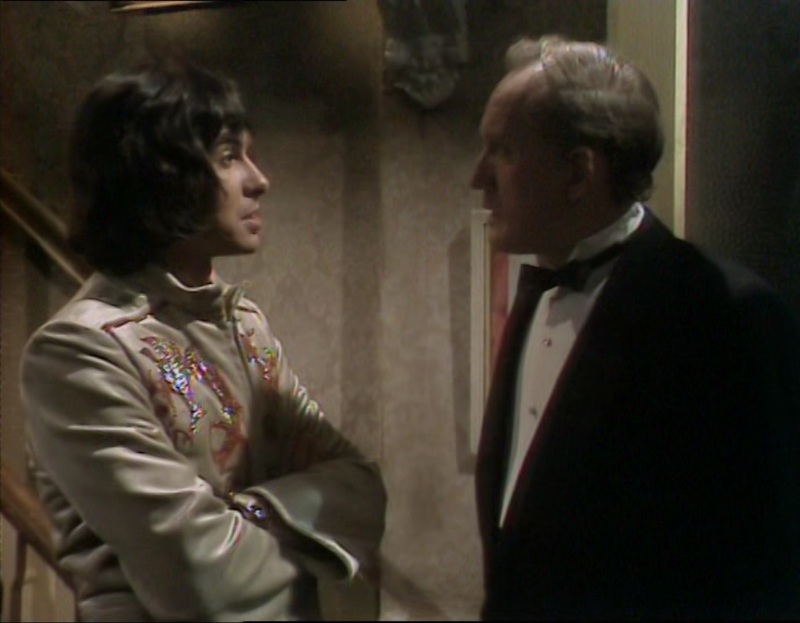 The package was 13 episodes, but the existing series three is 20 episodes, comprising six stories. So, was this a package of four of the six existing stories, or, more tantalizingly, might this have been the first season, which could have been more likely? Did Taffner have thirteen episodes of the show long after Thames wiped their copies? Stranger things have happened. In 1973, the BBC made a glacially-paced space drama called Moonbase 3 that nobody watched and wiped their copies a few years later. 20th Century Fox had co-produced the show, thinking that it might run on ABC, and held onto their set. In the early nineties, the Sci-Fi Channel launched, desperate for programming, and bought the show from Fox, surprising all the “telefantasy” fans in the UK who thought that the series was gone forever. I wonder whether the same thing might have happened with Ace of Wands, or whether the package was just 13 of the surviving 20 episodes. I only have time for a short post today. This is such a great little story. It’s so amazingly 1972 with its depiction of psychic powers and seances. I’ve read about an American supernatural drama called The Sixth Sense that starred Gary Collins and aired that year, and this seems incredibly similar to everything I know of that show, with mediums and spiritualists and ancient powers from thousand year-old priests taken as common and as basic as plumbers and real estate agents. There was definitely something in the air in the early seventies. Our son pronounced this as being “bad scary,” and he spent the half hour curled up beside Mom, worried and wide-eyed about the possibility of dangerous energy from “the other side.” Great stuff. Our son reminded us that this was not his first go-round with mummies – he’s seen them as “beasts of the week” in both The Ghost Busters and Monster Squad – but this is his first time dealing with one that isn’t played for laughs, in a proper tomb-of-the-pharaohs, supernatural-horror-from-the-grave sort of way. 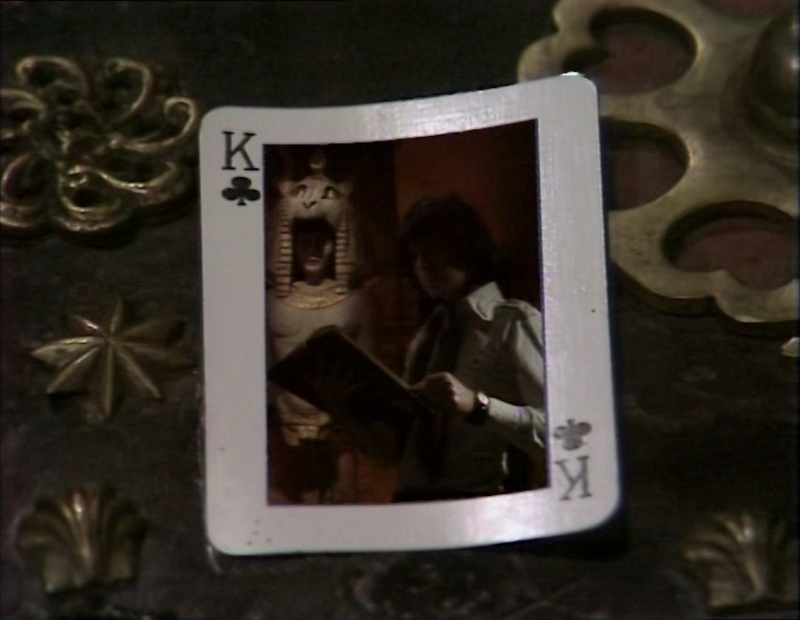 You add this imagery to the seventies’ interest in psychic powers and seances, and you’ve got something guaranteed to give a six year-old a good little scare. 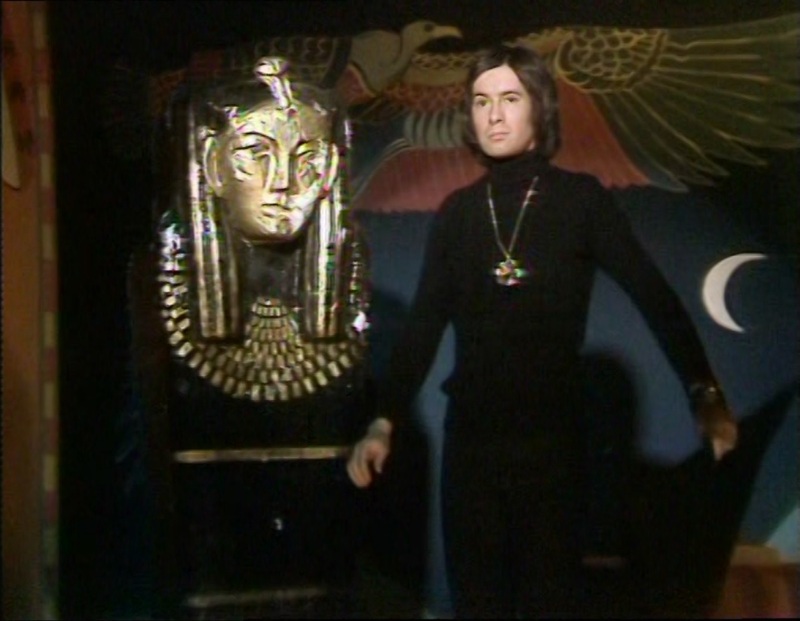 “The Power of Atep” is written by Victor Pemberton, and it certainly got some inspiration from Hammer’s Blood from the Mummy’s Tomb, released the previous year. This doesn’t have a fellow in bandages shuffling around, it has eerie voices and powers that can possess good people. 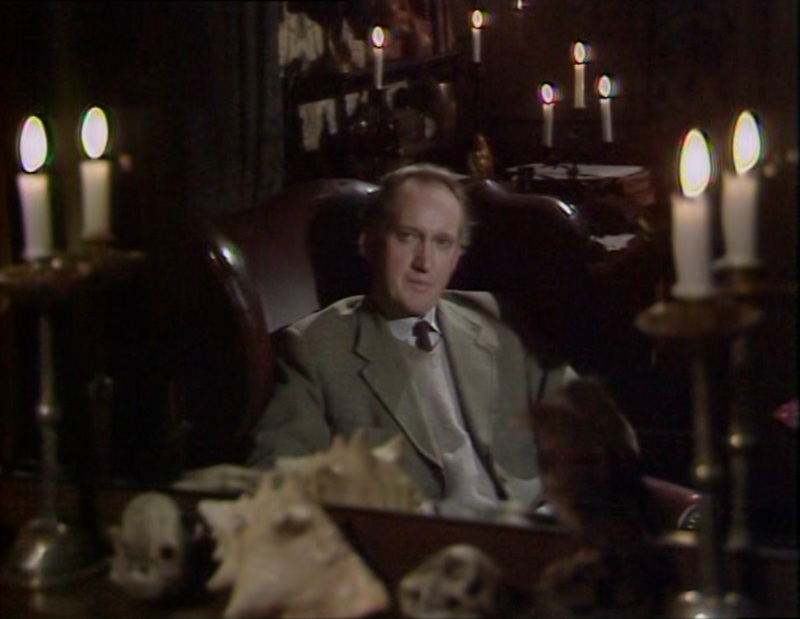 Returning to action in this episode, it’s Donald Layne-Smith as Tarot’s friend Mr. Sweet, an antiquarian bookseller who now works with a university in London. He’d appeared in at least five of the earlier, lost episodes. And this time, we get a flashback to one of Tarot’s stage acts. He had a partner on stage called Quabal, and we don’t actually see him. I don’t think our son caught that detail. This is so much better than “The Meddlers.” It’s a more confident script with a genuine supernatural threat, and it’s far better directed. If I recall correctly, the production will disappoint a little in the next installments, but so far this is off to a fine start. You have to accept a certain amount of fumble in stagy British videotape drama from the early seventies. Still, the surprise appearance of both a whacking huge microphone and, in a later scene, one of the cameras really is amazing. 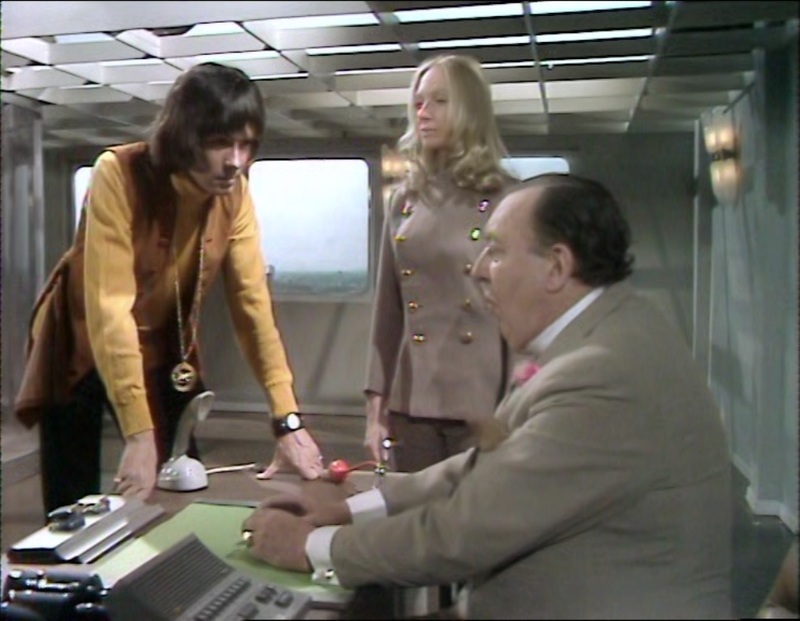 I think that Ace of Wands was made in much the same way that Doctor Who was in the seventies, with the director working from a control booth and cutting from camera to camera. Did he just not notice these intrusions? Was the budget so tight that they couldn’t afford retakes? I’m certain there’s another accident that happens in the climax, when Tarot reveals all and lets everybody know that the treasure everybody’s looking for – the reason villains are trying to get the people who work the market to clear out – is not a chest full of thousands of pounds, but a chest full of hundred year-old IOUs. The stagehands above the set tipped a cascade of dust and dirt between the cameras and the actors, and Michael Mackenzie got some in his eyes. He delivers his lines flawlessly while simultaneously blinking furiously. I bet that was amazingly uncomfortable! I didn’t actually ask our son what he thought of this story. I didn’t need to. He waited patiently but wasn’t at all engaged or excited. I’m amazed that they did something so down-to-earth and ordinary to launch a new season and new cast. The other five stories have their share of troubles from tight budgets, but none of them are so darn mundane. On the other hand, he corrected his mother, reminding her that the name of this series is Ace of Wands and not The Tarot Show as she called it, so he’s paying attention!